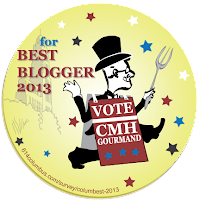 One of Columbus' food ambassadors has been nominated for 614's Best Blogger. Jim has been an integral part of the Columbus food culture long before the word sustainable was forced down our gullet. His innumerable contributions include: writing for Taco Trucks Columbus, Alt.Eats.Columbus, and WCBE Foodcast, judging competitive cooking, organizing the Pizza Grand Prix I-VI at Wild Goose Creative, going to school for post graduate training in hot dog science. He scours every culinary niche of the city exploring the food, the experience and the historical context of that food for us to enjoy on CMH Gourmand. Each post introduces us to good food and the inspiring people who prepare it. He recognizes the good in our community and diplomatically spares us the rare disappointing experiences. I don't take his queues only to find a good meal, but to learn more about Columbus through food. We all benefit from Jim's past and continued efforts to educate us (there are also exhaustive pursuits of donuts and dagwoods). CMHGourmand is bigger than any award, but this would be a nice way to express thanks for his efforts. I hope you'll consider a vote (you need only your Facebook login to vote, he is under the category People & Community, which is apt, he's as much about community & people as he is food).